Dolby Atmos was initially introduced to the world through cinemas and is considered the crème de la crème of sound bar features. It’s the newest development in surround sound and is supposed to create an authentic cinematic experience in the comfort of your own home. By bouncing sound waves off the walls and ceiling, it immerses you in captivating, moving audio that feels like it’s flowing all around you. Described as object-based sound, Dolby Atmos transports you into the heart of the action by illustrating the movement of every object, meaning the sound of soaring aeroplanes, thunder or birds can be heard and felt above and around you. So if you’re watching your favourite artist on stage at The Brits, it’ll feel like they’re performing in your living room. A sound bar with Dolby Atmos should give you a full surround sound experience without the need for a multi-speaker home cinema setup. But, while many sound bars claim to deliver virtual surround sound, we’ve found that the majority fail to do it well. It’s easy to end up paying for a model that promises enveloping audio yet delivers a flat, dull experience. It may be hard to imagine impressive, room-filling surround sound coming out of one small device. Nevertheless, we’ve uncovered some good models with Dolby Atmos, plus one Best Buy that left our tough listening experts speechless. But recent tests have also exposed a very expensive Don’t Buy by Bose. Make the right purchase and check out the models below or head straight to our sound bar reviews. 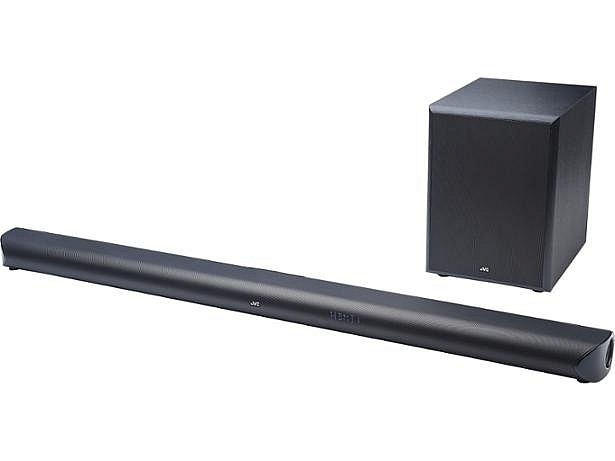 The below models have Dolby Atmos as well as other common sound bar features including a wireless subwoofer for extra bass, Bluetooth and wifi. Some also have DTS:X, another cutting-edge surround sound format. Explore their additional features below and follow the review links to discover whether they have powerful, immersive sound. 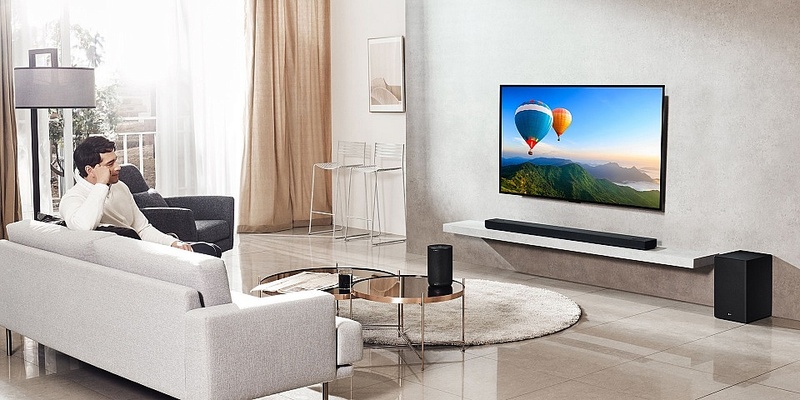 This high-end sound bar has an abundance of features, including built-in Google Chromecast, which means you can stream music to the sound bar from apps such as Deezer, Google Play Music, Spotify, Tidal and YouTube. You can keep playlists from different streaming services in one place using a Cast-enabled app. Additionally, products that are part of LG’s ThinQ AI system can be controlled with your voice when connected to a compatible Google Assistant speaker. So you can control music, TV and movies being played through the SK8 and the other LG sound bars mentioned below. TV dramas, sports, movies and music all have different audio profiles. Thus, LG has added Adaptive Sound Control to their sound bars to create the optimal entertainment experience. This feature automatically adjusts sound settings to suit a wide range of media. In addition, audio sync correction should mean you won’t be frustrated by annoying lip-sync issues. This model sounds perfect on paper and is cheaper than most with Dolby Atmos. But is it too good to be true? Find out if it impressed our listening experts by reading our LG SK8 review. 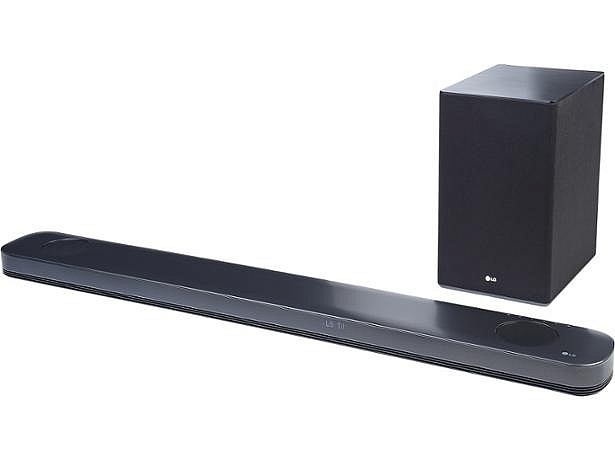 LG brands the SK9Y ‘The Sound Bar for the Serious Watcher’. It has the same impressive features as the SK8, including High Resolution Audio for life-like sound, Chromecast built-in and Google Assistant compatibility. It also has two up-firing speakers to transport you into the action. As 4K resolution is the new video quality standard for TVs, the SK9Y also has 4K pass-through. This means that it is able to input and output the 4K signal without reducing image quality. 4K pass-through allows you to connect your TV, games consoles, set-top boxes and streaming devices to your sound bar without compromising on audio and picture quality. If you decide to upgrade and enhance your home cinema setup, this model is designed to work with the optional SPK8-S wireless surround speakers (sold separately). Some feature-packed sound bars have flawless sound to match, but we’ve found models with sound so average their features can’t save them. Find out which category this one falls into by reading our LG SK9Y review. Vertical Surround Engine is Sony’s latest surround sound technology and it means you should be able to enjoy an exhilarating cinematic experience with the newest formats such as Dolby Atmos and DTS:X. The HT-ZF9 has a cinema mode to intensify movie quality, plus it also has settings to boost music, games, news and sports. If you love music, you may be tempted by the built-in Chromecast, which lets you stream music, online radio and podcasts from your smartphone, tablet or laptop. Plus, High-Resolution Audio and DSEE HX™ technology should amplify music to near high-resolution sound quality. This model works with the Amazon Alexa and Google Assistant, so you can use effortless voice commands to adjust volume, play your favourite song or change the channel. You may be hoping to strike a bargain with this model as it’s one of the cheaper Atmos sound bars and is full of attractive features. 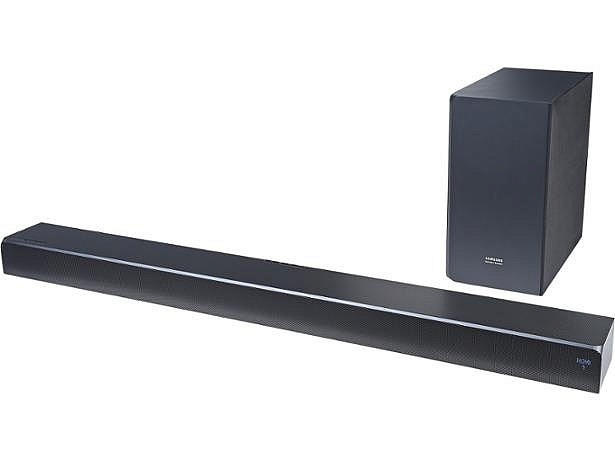 Find out if you can get a brilliant sound bar for less by reading our Sony HT-ZF9 review. 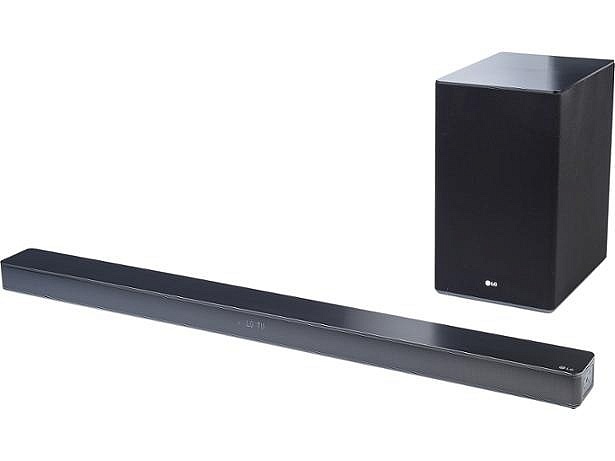 This large sound bar is made for LG TVs with screen sizes between 55 inches and 65 inches. It has Meridian technology designed to create superior sound quality through enhanced digital processing for detailed, natural audio and effective sound effects. Plus, Hi-Res Audio playback means the sound bar is compatible with a range of HD audio formats. Like the SK8 and SK9Y, this model has Adaptive Sound Control to analyse the signal and adapt the sound balance accordingly. For example, if it detects dialogue, it’ll lower the bass in response, making programmes with high levels of speech clearer and more detailed. Is it worth getting the SK10Y over one of the cheaper LG models mentioned above? Our expert LG SK10Y review will tell you whether the sound bar’s fancy features live up to expectations. 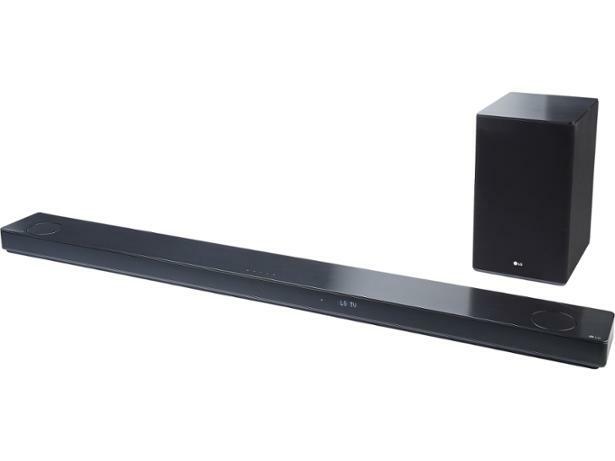 Samsung claims the HW-N850 provides the mind-blowing audio you would expect from a high-calibre sound bar. With DTS:X as well as Dolby Atmos, Samsung has branded the model as its Cinematic Wireless Smart Soundbar. Designed to deliver clear, dynamic audio, it has 13 individual custom-designed built-in speakers, including two up-firing and two side-firing speakers. It can be connected wirelessly to selected Samsung TVs, and High Res Audio playback should create studio-quality audio when listening to music by transforming every song you play into the highest quality. This model costs more than some TVs, so it’s worth reading our Samsung harman/kardon HW-N850 review before you commit to buying it. You should, in theory, get impressive cinematic sound from this model, not just due to Dolby Atmos but also because it has ten built-in speakers designed to deliver three-dimensional sound. Whether you’re watching the news, sports or a movie, you can choose from a range of equaliser presets to optimise the audio and get the most out of what you’re watching. 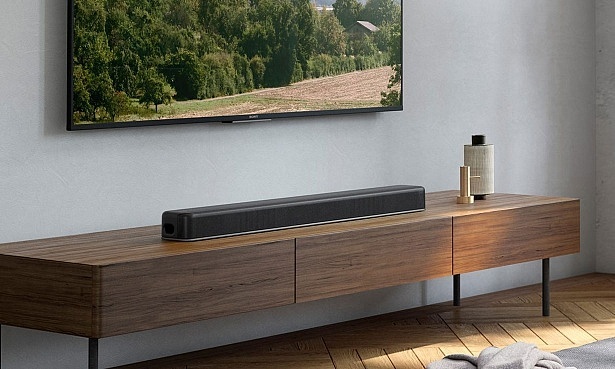 This sound bar doesn’t come cheap but its high-tech features promise it’s a worthy investment. You’ll want to be confident it’s among the best around for sound quality before getting your credit card out. Find out how well these features work in practice by reading our JVC TH-D588B review. Sony has revealed its new sound bar that has Dolby Atmos and is quite cheap for a model with this popular feature. Like the HT-ZF9, the HT-X8500 uses Sony’s Vertical Surround Engine technology to deliver Dolby Atmos and DTS:X. It also has a built-in dual subwoofer, preset modes to enhance different media types and 4K HDR compatibility. We’ve found Best Buys in this price range so this model could be a hit. It should be on sale towards the end of March so watch this space. 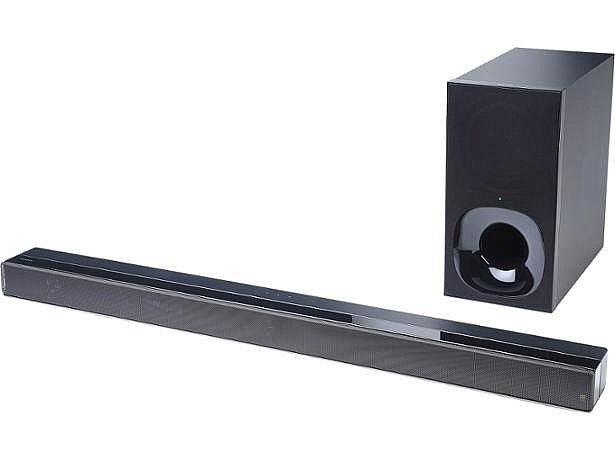 If you can’t wait until then to bring cinema-quality surround sound to your home, we’ve unveiled several Best Buy sound bars for less than £350.